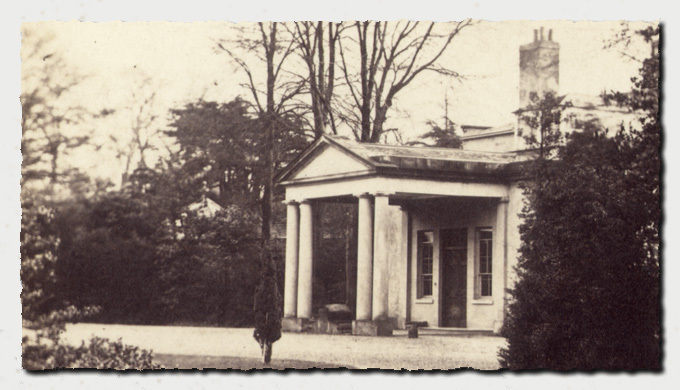 The picture above is the only known image of the entrance to Parlington Hall, the Porte Cochère . The earlier version of this site recognised that the original Porte Cochère was taken in the early part of the twentieth century and relocated to form a garden feature at Lotherton Hall, in the appropriately named, Parlington Garden . 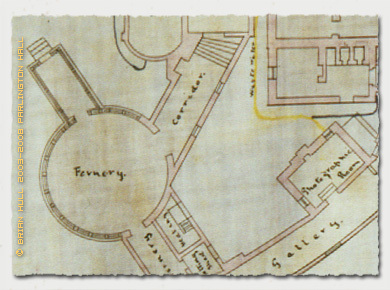 Visiting the gardens some years ago I questioned whether the structure as found there was in fact the original, but it does match the layout of the hall drawn by Fowler Jones in 1885. My comments at the time were as follows, Reputedly, the Porte Cochère to Parlington Hall, was removed to the gardens at Lotherton Hall. 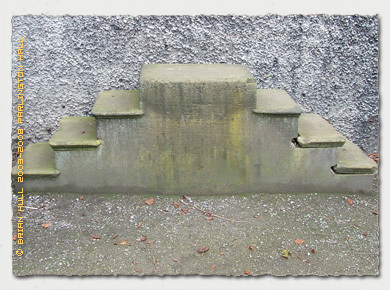 It matches the Fowler-Jones plan of Parlington of 1885, however it may only be a part of the entrance portico as two very large pieces of stone masonry from an entrance are still lying near the Hall site. The profile of the cornice appears the same as the remnants found at Parlington. 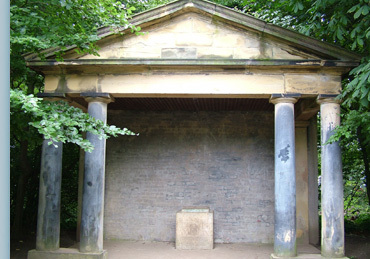 The original portico had a mounting block between the columns, this is probably the one that is to be seen adjacent to the front entrance at Lotherton. 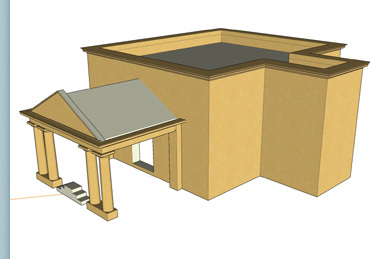 The text was accompanied by a small 3D sketch of my idea for the style of the entrance, this is the image below as was presented in the earlier site design. Two things become clear as a result of having the new stereo photographs, firstly the presumption that the entrance hall was single story is correct, but the detail of the junction between the eaves and the main wall of the building was wrong. The cornice continued at the same height as that of the porch [Incidentally the term porch will be used here in future rather than the traditional term of Porte Cochère , which is something of a mouthful, if you take my meaning] The image below shows the cornice of the porch returning along the face of the elevation. Secondly the overall height of the building on the elevation beyond the porch was not known, but the chimney stack just off centre in the image below helps to understand the detail of the plan, it stands some feet above the eaves which can be seen off to the left of the stack. So although the picture is ostensibly of the porch, other questions have been answered. 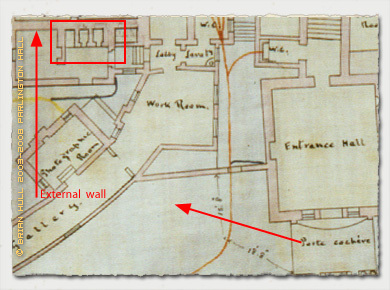 The chimney described in the previous paragraph is highlighted on the plan below, probably the boiler room to the hall, evidence has been found of circulation pipes for some form of central heating. 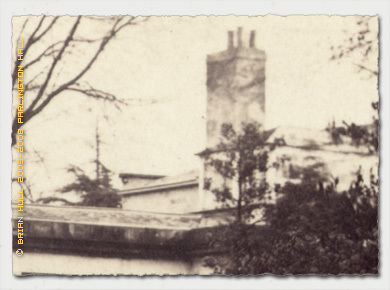 The wall beneath the eaves at the left of the chimney stack is that marked on the plan with the vertical arrow and the approximate direction of the photo is depicted by the arrow in the bottom right. From this information it is possible to draw some conclusions as to what formed part of the main house structure and which bits were single storey ancilliary additions. 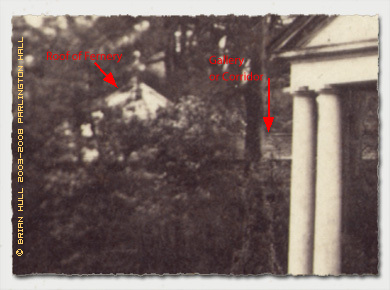 Looking closely at the image to the left of the porch can be seen the conical roof of the fernery. Also the roof of the Gallery or the corridor leading from the fernery, as shown below. 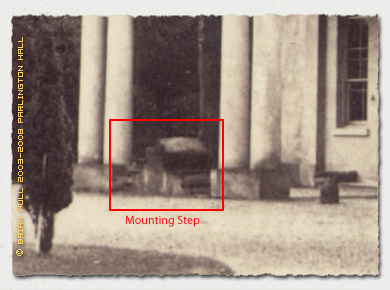 The stone mounting step is sited between the main pillars of the porch, whether this is the one that can be found at Lotherton Hall shown below, is uncertain, but as it well worn I suspect it may well be. The Porte Cochère is a rather grand name, French obviously, for the covered area to the main entrance. The purpose of the structure was to act as a temporary shelter for the coach so that passengers alighting or entering were not exposed to any adverse weather conditions.